Boat trip: Melk, Krems, Dürnstein. 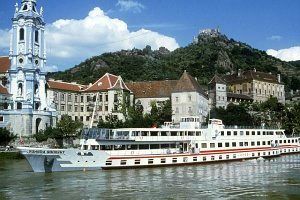 This full-day excursion will lead you to the romantic scenery of the Wachau. You will pass beautiful old villages, steep vineyards and medieval castles. In the castle of Dürnstein King Richard Lionheart once was imprisoned, while waiting for his ransom to arrive from England, raised by his true minstrel Blondel. Enjoy a boat-trip through this astounding landscape and dicsover the old wine-merchants town Krems, right in the heart of the Wachau. 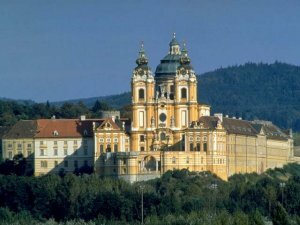 One of the highlights of the day will be the visit to the magnificent Benedictine Abbey of Melk, a masterpiece of Austrian Baroque architecture. The boat-rides take place from April to October.